A funeral service for the late chairman of Hanjin Group and chief executive of Korean Air Cho Yang-ho was held at Yonsei Severance Hospital in northwestern Seoul on Tuesday. At the ceremony attended by Cho's family, executives and employees of the conglomerate, the chief executive of the group's holding company Seok Tae-soo gave the eulogy. As one of the people close to the late chairman, Seok said it was a great blessing for everyone who took part in Cho's long journey to expand the economic territory of South Korea in the air, the sea and on land. 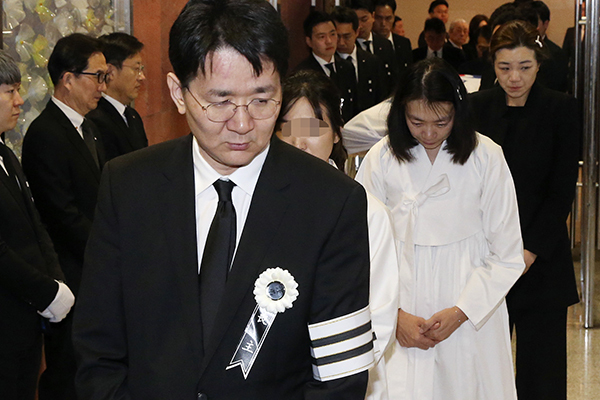 Cho's hearse, accompanied by his three children and grandchildren, visited the airline's main office in downtown Seoul and its headquarters in the western part of the city, where he received a send off from employees. He was laid to rest near his late parents in Yongin, Gyeonggi Province. The 70-year-old businessman, who had been receiving treatment for a chronic lung disease in the U.S. since December, died in Los Angeles on April seventh.